Established for over 50 years in the industry, this company is very much sought-after for its electrical maintenance, service, and installation assistance to a big number of industrial and commercial firms in the metro. But walk-in customers in need of electrical assistance are also welcome in the company’s shop. The business acquired a B.C. Hydro Smart certification, making it more reputable in Vancouver. The company has been generating income through its rendered core electrical maintenance and services. But it has a huge potential for expansion if it will do biddings on electrical contracting projects. This is something that the new owner can delve into. The current business owner also had plans of expanding the coverage area and rendering services in other parts of British Columbia. The company also has developed strong, long-term business relationships with a big number of clients from various industries over the years. Its employees have been affiliated with the company for a number of years already. They are heavily equipped with excellent electrical skills and good customer relations, giving the company a very good reputation. This makes both their loyal and new clients assured that the work staff can provide top-notch services. The company’s work force is comprised of unionized services technicians from Local 213 of the I.B.E.W and of non-unionized (and equally skillful) office-based employees. The company is requiring a contractor’s license for each of the employees for the electrical permits, to make them suited for work. In addition, the company makes use of advanced equipment, making their services done in a short span of time. It would matter if the new owner is knowledgeable in operating a business such as this but it would be a plus if he/ she has a solid electrical and management background. For a smooth transition, the current owner commits to conduct a training for two months and to set up meetings so as to introduce the new owner to the existing clients. The seller is willing to discuss further information about the business. Interested buyers can inquire by directly reach the seller through the given contact details. 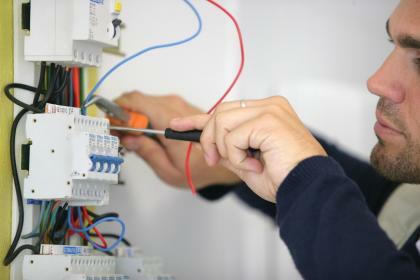 This high-regarded electrical maintenance, service, and installation company has its shop located in Metro Vancouver. It has been leasing a 3,500 sq. ft. space with CAD $ 36,000 annual rental fee. The owner will turn over the detailed list of assets and their corresponding value, their client database, and their financial reports for three years to give the new owner a deeper grasp on the business. In order to further grow the business, this electrical company should look into bidding in more electrical contracting projects, which are considered more long-term in nature and provide higher service payments. The fixtures and inventory amounting to CAD $ 85,000 and 25,000 respectively are already accounted in the purchase price. Value of other assets to be passed on to the new owner is already considered. The charge for the training is already included in the asking price as well.